Timing dials that begin at .75 seconds and end at 5.25 seconds. Imprinted or cast stars, arrows, and “US”. Timing dials that begin at .5 seconds and end at 5.5 seconds. No imprinted or cast markings. A screw insert that is unthreaded at the top. 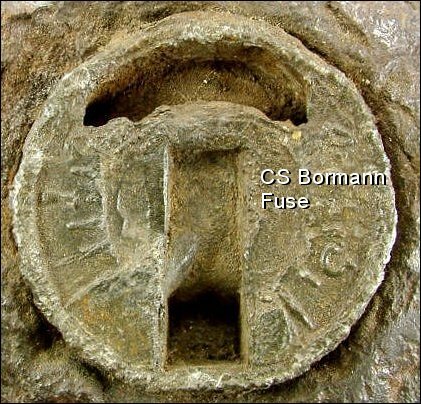 Civil War artillery expert, Peter George, has observed another difference between the two fuses. The difference occurs at “G” in the figure below at the covering of powder channel “C” that leads to the small powder magazine “D”. George describes this structure as the “Pump Hump” in the wrench key slot. 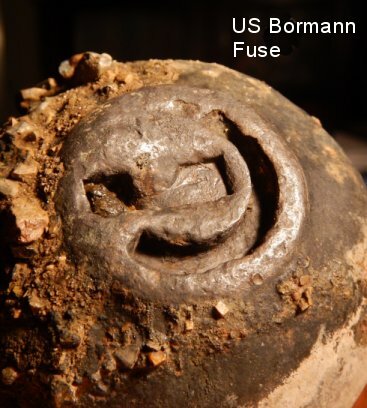 Extent and shape of the Pipe Hump “G” on US Bormann fuse. Figure after Dickey and George. 1980. The main differences between the two fuses occur in the sizes and extent of the Pipe Hump. 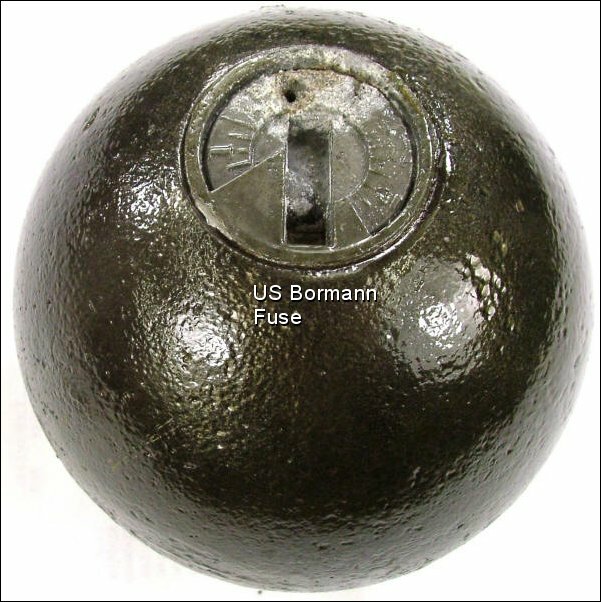 In side view, the US Bormann fuse Pipe Hump extends all the way up the left wall of the wrench slot while the CS Bormann fuse does not. 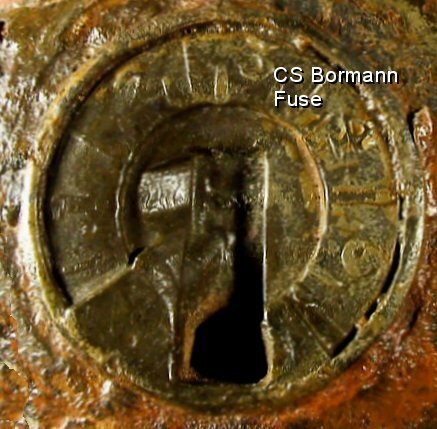 Side view of US and CS Bormann fuses showing differences in the extent of the Pipe Hump on the left wall of the fuse wrench slot. There are also differences between the fuses in their extent on the floor of the wrench slot. 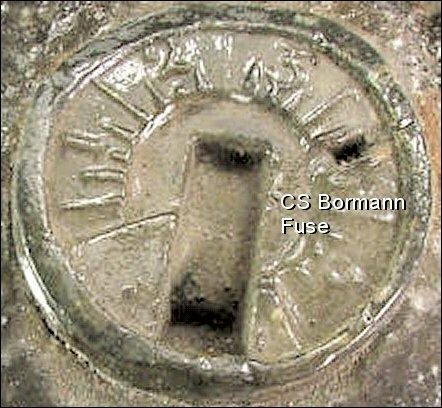 The Pipe Hump of the Confederate Fuse is much smaller than that of the Federal fuse as shown in the figure below. 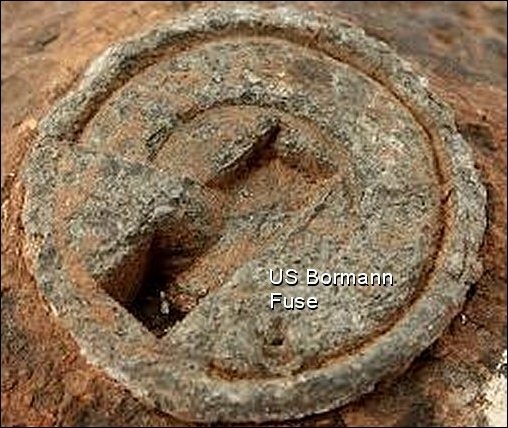 Differences in the extent of the Pipe Hump in the Bormann wrench slot of Confederate and Federal fuses. Here are some good examples gleaned from the Internet. 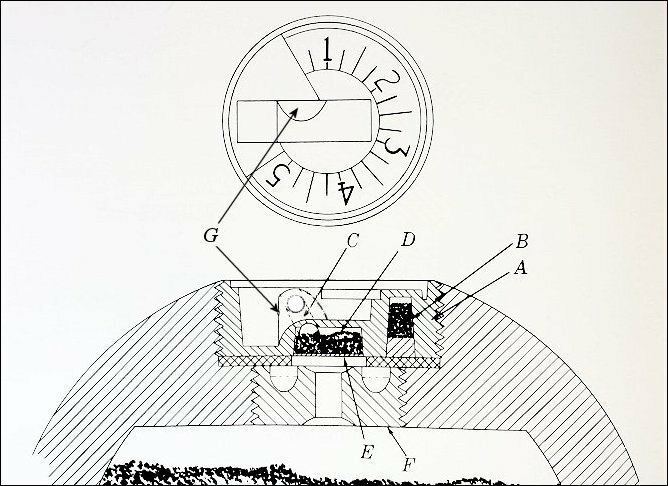 Confirmation: Shape and extent of Pipe Hump and timing dial that begins at .5 seconds and ends at 5.5 seconds. Confirmation: Timing dial that begins at .5 seconds and ends at 5.5 seconds. The distinguishing criteria can even be used when the dial face is devoid of numbers or gone entirely.